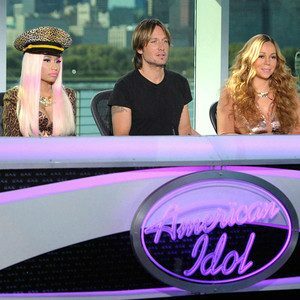 American Idol: Mariah Carey, Nicki Minaj and the Hype Premiere at Last! Presumably some new talent was discovered on the 12th season premiere of American Idol tonight. But what everyone really wants to know, of course, is what Nicki Minaj and Mariah Carey were really like in action—and whether they could stop taking jabs at each other long enough to judge at least a few aspiring singers. Well, so long as more hopefuls like Mike Buonopane don't mind kicking off their auditions while the two divas argued about Nicki's hat and whether Mariah was dissing it by saying she'd have brought her dog if she knew "accessories" were allowed. Teena Torres, a 28-year-old alumna of a Camp Mariah singing program, fared better. "I gotta go first, I'm sorry," Mariah insisted in being first to sing Teena's praises. "We're all sitting in awe, blown away," interjected Nicki, giving the first sign that Idol is going to resemble The View this season. Because of the editing and the hype, we may never know just how problematic the ladies on the panel are, but Mariah's seemingly overstated antics and Nicki's eye-rolling at least made for compelling (for these two hours, at least) television. And, happily, the talent pool in New York City offered up 41 promising fish, including 21-year-old music student Christina Isabelle; 23-year-old Shira Gavrielov, who had a No. 1 single in Israel; 24-year-old Brooklynite Frankie Ford, who honed his craft singing on the subway; student and blueberry farmer Sarah Restuccio, 17, who's proficient in both country and "Superbass"; 18-year-old Angela Miller, who has partial hearing loss in both ears; and Ashlee Feliciano, 20, whose family fosters medically challenged children. Quite the assemblage! Too bad they spent so much time on bad news—there was way more rejection than fighting tonight (though the tease is that things get super-juicy on tomorrow's Chicago-set episode). "I feel like we jell well," Nicki declared at the end of the New York round. And, for the record, we're happy that 28-year-old Brett Holt didn't have to actually experience the kinda cruel trick played on him in the editing process: All of the judges said enthusiastic yeses following his uneven take on Nat King Cole, after which a little cartoon frog appeared, channeling the fact that the yeses weren't real, followed by the judges' unanimous dismissal of him.